BRIDGEWATER, Mass. 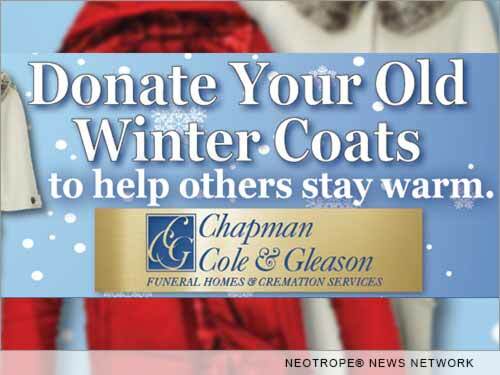 /Massachusetts Newswire/ — Family-owned Chapman, Cole and Gleason Funeral Homes has announced their fourth annual Winter Coat Drive for those in need. And if you were living in Massachusetts last winter, you remember not only how the snow kept coming and coming, but that it was so cold for so long that it didn't melt for months. "We never know what to expect from winter in Massachusetts," says Mark Chapman, Director at Prophett-Chapman, Cole & Gleason Funeral Homes in Bridgewater and East Bridgewater, "but we know how bad it can get. Imagine dealing with all that if you or your children don't have a decent winter coat." That's what the 150-year-old, family-owned Chapman, Cole & Gleason group of funeral homes had in mind when they first launched their annual Coat Drive. "Massachusetts families have been very good to us over the decades," said Chapman, "so we want to do what we can to help those less fortunate than us with the Coat Drive." You can donate a winter coat at a Chapman, Cole & Gleason location in Bridgewater, East Bridgewater, Falmouth, West Falmouth, Marstons Mills, Mashpee, Martha's Vineyard, and Wareham. For directions to the location nearest you, go to http://www.ccgfuneralhome.com/.